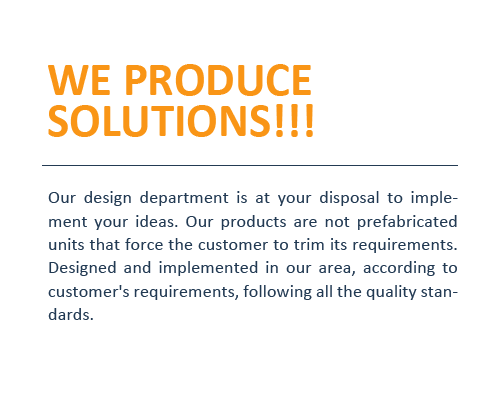 Our design department is ready to implement your ideas. Our products do not involve prefabricated units that force customers to adjust their requirements. They are designed and manufactured in our factory, according to the customer's specifications and all quality standards. Our collaboration will be completed by the control process and technical support that follows installing and operating the unit in your area. 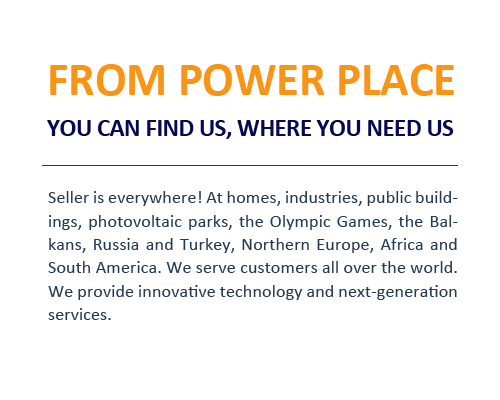 solar parks, the Olympic Games, the Balkans, Russia, Turkey, North Europe, Africa and South America. Apart from our headquarters in Attica, our people serve customers all over the world. We provide innovative technology solutions and next generation services that exploit the industry's thorough knowledge, rather than offering prefabricated units that make customers adjsust their requirements. Our staff constitutes the confirmed result of human resources planning involving executives with excellent know-how and many years of experience. Thorough knowledge of the subject is continuously enhanced by seminars taking place in the company or elsewhere. Quality is secured by SELLER HELLAS' insistence on creating a devoted, dynamic and ever developing work environment, which will attract the best partners. Here, at Seller Hellas, we are aware that the most advanced equipment is required, in order to be able to offer the best products. Therefore, we keep investing in cutting edge tools, so as to achieve high standard products. We possess all the tools required, in order to make what you have imagined.